Page-turning... Set against the political and religious turmoil of the times, the Thoenes story vividly reimagines the evolving friendship between Jesus and Lazarus. - Publishers Weekly. LAZARUS---the man Jesus raised from the dead in one of the most extraordinary encounters with The Living Savior in all of Scripture. But the life of Lazarus holds interest well beyond this miraculous event. Living in Bethany, near Jerusalem, Lazarus witnessed many of the most important events of Jesuss life and ministry. Lazarus owned a vineyard and devoted his life to caring for its vines and fruit. But he encountered another man---Jesus---whose vineyard was the world, its fruit the eternal souls of men. When Lazaruss story and the story of Jesuss crucifixion and resurrection touch in When Jesus Wept, we are offered a unique vision into the power and comfort of Christs love. 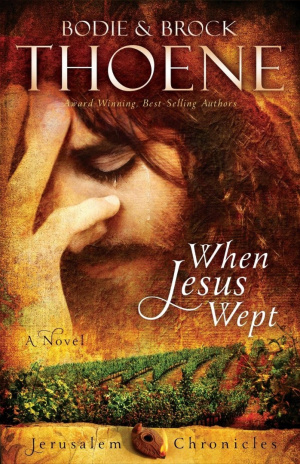 Brock and Bodie Thoenes most powerful and climactic writing project to date, When Jesus Wept, captures the power and the passion of the men and women who lived through the most important days in the history of the world. When Jesus Wept by Bodie and Brock Thoene was published by Zondervan in March 2013 and is our 15131st best seller. The ISBN for When Jesus Wept is 9780310335931. Be the first to review When Jesus Wept! Got a question? No problem! Just click here to ask us about When Jesus Wept.